The final data of the population census held in 2011 started to be disclosed on 28 March 2013. The Hungarian Central Statistical Office held a press conference titled “Preliminary data of the population census 2011” on 27 March 2012. Every year the pocketbook is the first detailed publication comprising all themes, which informs on the socio-economic processes in the previous year according to preliminary data. Its regional chapter presents the different regions, while the international chapter allows for the comparison of major data first of all on the member states of the European Union. The interpretation of figures is supported by methodological descriptions, while orientation by several charts. Our publication titled ”Statistical Yearbook of Hungary, 2013” presents the socio-economic trends in Hungary and the main characteristics of environment in 620 tables, using information collected and processed by official statistics. Changes in key indicators are illustrated by coloured charts at the beginning of the volume. 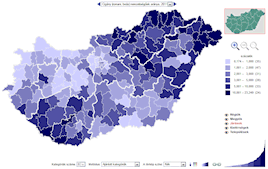 The Hungarian Central Statistical Office conducted the 15th census of Hungary in October 2011. Nearly 40 thousand enumerators visited about 4.4 million dwellings in order to collect data on the social, demographic and economic characteristics as well as on the housing conditions of the population in Hungary. Processing and publishing census data is a process of several years. Our present publication shows the changes in the population number and in the most important data of the dwelling stock.